Lahaina, located on the west side of the island of Maui, is known for its sunny, dry weather. With an average of only 13" of rain per year, Lahaina is the perfect place to sight-see from a convertible-- be it people-watching or sunset-watching. The drive from Kahului Airport takes about 40 to 45 minutes. The town itself stretches about 1.5 miles northward along the coastline, but you won't really need to drive your rental car to see historic Front Street. We suggest you follow our parking tips at the bottom of this page. You'll arrive on Front Street when you drive into Lahaina. This area has a nearly 200 yr. old, colorful history of whalers, missionaries and their respective excesses. 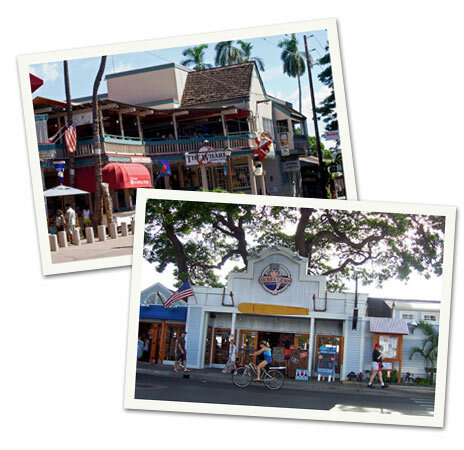 Today Lahaina is a National Historic Landmark. Be sure to visit historic sites in this city, such as the beautiful old banyan tree with its 12 huge trunk. Nearby, you'll find the rebuilt ruins of Lahaina Fort, originally constructed in 1832. Per capita, you'll find more galleries located in Lahaina than anywhere else in the United States. Known as the "Art Capital of the Pacific" you can stand with works created by world famous masters or shake the hand of local craftspeople. We suggest you search out local artisans. The work you purchase from that artist will have added meaning for years to come as you recall your Lahaina discovery. Lahaina is a great location to find locally made souvenirs and gifts for yourself or friends and family back home. Beautifully packaged native edibles, handmade crafts as well as locally produced bath and body products are fun to purchase along Front Street. You'll be delighted at the reasonably priced treasures available. We feel it's important to support locals who live here and contribute their skills to keeping Lahaina unique. You decide: tacky, imported grass skirt and coconut shell bra from the Hawaii import chain, or locally handmade earrings? A major celebration on Front Street is Halloween. If you have late October vacation plans, don't miss the fun. Front Street is closed off to traffic so the kids can take part in a costume parade. After they go off to enjoy the spoils of their frolicking, outrageously attired adults come out to play as Front Street becomes a wonderful, colorful party. Get out on the water! Water-lovers have no end of tour choices in Lahaina. Consider parasailing for that ultimate view of the area. Or take a surf class and ride a wave. If you prefer to be underwater, learn to dive. With experience, you can take part in a diving tour. If you love boats, you might sail to another port, or ride a modern, 48-passenger submarine to the ocean bottom and back along Lahaina's coastline. You can ride an ocean-going raft to watch dolphins, snorkel off Lanai, or visit a sea cave. Whale-watching tours (best in Jan through March) are a favorite or ours. For a more relaxing experience, dinner and sunset cruises are always popular. If you want to have the ultimate dining experience in Lahaina, think local. Look for cafés and restaurants that serve locally grown ingredients as major components of their menus. We aren't suggesting you dine on mashed taro. We do hope you'll seek out specialties, such as those that fuse fresh, local abundance (produce, meats and fish) with Asian or European influences. Casual dining should offer local fare as well. Nothing is better than a salad of local, sweet lettuce. Locally caught fish for delicious Fish n' Chips is readily available. If you are staying in a condo or have access to a kitchen, shop the Lahaina area farmers markets for better-than-supermarket prices on local fruits and vegetables. 'Ulalena is probably Lahaina's most spectacular entertainment (and hot ticket) available. Hawaiian inspired, this 75 minute performance, will leave you breathless. But, whether you want to see a theatrical production, or listen to a slat-key guitar artist, we suggest you get out and enjoy Lahaina's nightlife. Live music is found everywhere in Lahaina. Sway to traditional Hawaiian sounds, dance to jazz and blues or boogie to requests played by a friendly DJ. If you are driving to Lahaina from out of the area, we recommend getting here by 8:30 to 9:00 am. Parking spaces fill up fast. There is a 3-hr. parking lot (watch your time here) at Front and Prison Streets, and another at Front and Shaw Streets. Please note that empty bus parking spaces are not available for other vehicles.